Tomasz Adamek, left, will face the biggest test of his career in Andrew Golota. When the going gets tough, Andrew Golota usually finds a way to excuse himself from a fight. A win over Andrew Golota will make Tomasz Adamek one of Poland's brightest stars. Cruiserweight champion Tomasz Adamek couldn't get Bernard Hopkins into the ring, so he's taking the leap that many cruiserweights have taken. He's going to test the waters at heavyweight by facing Polish countryman Andrew Golota on Saturday in a 15,000-seat arena in Lodz, Poland, about 85 miles from Warsaw. Although the 41-year-old Golota has long worn out his welcome in most places, in their country the bout is a big deal, referred to as the "Polish Fight of the Century." That's even though Golota has always disappointed in his biggest fights, going 0-3-1 in heavyweight title shots, quitting against Mike Tyson and twice getting disqualified against Riddick Bowe. How big is Adamek-Golota in Poland? • It will be the biggest audience ever (15,000-plus) to watch an event in Poland's biggest arena, Arena Lodz in Lodz. • Golota's 1998 fight with Tim Witherspoon generated Poland's largest TV audience ever, which exceeded a 2005 visit by Pop John Paul II. Polsat expects this fight to break the record. • Polsat predicted that 1 in every 4 Poles will watch the fight with viewership expected to exceed 10 million in a nation with a population of approximately 40 million. • The card will be a five-hour live televised program, which will begin on cable and switch to terrestrial TV on Polsat, Poland's biggest network. The only other time that has been done was when Poland played in the World Cup. • Polsat will use 23 HD cameras to cover the fight. "Golota and Adamek are fighting for something bigger than a world championship or money. They're fighting for country," said Don King, who promotes Golota and used to promote Adamek. "In Poland, this fight will compare to our Super Bowl or the World Cup in terms of demand and attention." Although Adamek is moving up in weight for the fight, he isn't necessarily leaving the cruiserweight division for good. He did vacate his alphabet title this week when, according Main Events promoter Kathy Duva, the IBF refused to grant him an exception in order to face Golota. However, Adamek still holds the Ring magazine title, which represents his status as the lineal champion, and he has not closed the door on returning to the 200-pound division after the Golota fight, win or lose. "Nobody can take away my Ring belt without beating me in the ring and that will not happen," Adamek said. "I'm open to [fighting the best] cruiserweights in the world if this is what television [networks] and the fans want me to do. Can you be the best cruiserweight in the world and try to be best heavyweight? Why not?" Said Duva: "He holds something very valuable and he is not going to give it away. He doesn't have to make any decisions right now. Tomasz is very comfortable at both weights. It's a win-win situation. We want to keep all our options open." 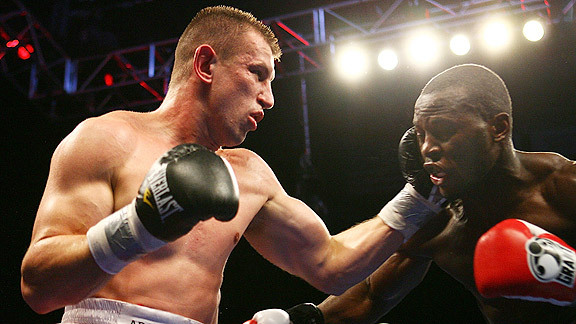 Tomasz Adamek had to part ways with a belt in order to fight Andrew Golota at heavyweight. Adamek's lone defeat came via decision when he lost his light heavyweight belt to Chad Dawson in 2007. Since then, Adamek has campaigned as a cruiserweight, winning seven fights in a row. He also claimed the world title with a stirring point victory against Steve Cunningham in a 2008 fight of the year candidate and has defended the title twice. Cunningham is Adamek's mandatory challenger, and Duva and Adamek have expressed interest in the rematch. However, fights with Hopkins or Golota were far more lucrative. When the bout with Hopkins couldn't be finalized, they opted for Golota. Cunningham, meanwhile, has been ordered to face Matt Godfrey for the vacant alphabet belt. Adamek said he has no concerns with putting on the additional weight to fight Golota. "Right now I weigh 215," said Adamek, 32, who makes his home in New Jersey now. "That is a very comfortable weight for me, very natural. I feel very good, in great shape. I can fight either cruiserweight or heavyweight. My natural weight is 215, so if more heavyweight fights can be made that would be good. We do not see any good cruiserweight proposals being made. "Maybe next year at the same time I can have a fight with the Klitschkos. It is my dream to be a champion in this category. In the heavyweight division whoever is smarter and faster can win. I am not afraid of anybody. I always believed that [the] world belongs to those not afraid of taking a risk. I'm ready to take my chances, I'm prepared mentally and physically to be a great heavyweight." Golota, who weighed in Friday at a career heavy 256 pounds to Adamek's 214.2 pounds, said Adamek is in for a rude awakening. "If somebody asks to me to dance, I never say no, and this was Adamek's idea -- not mine," Golota said. "So I said, 'Why not?' He has never fought anybody from the heavyweight division, and has no idea how hard we can hit." Sam Colonna, Golota's trainer, has worked fights as an assistant in Adamek's corner, and knows how tough he is. "[Golota] has to be busy because Adamek is one of the toughest fighters I ever saw in my life," Colonna said. "I will never forget the smell of blood when Adamek was fighting Paul Briggs the first time [to win a vacant light heavyweight title in 2005]. He fought 12 rounds with the broken nose, an injury he sustained two weeks before fight. We went through four towels just to get the blood from his face between the rounds. But Andrew can be the same way. He fought Mike Mollo with one eye, another one completely closed and begging doctors to not stop the fight." Adamek (38-1, 26 KOs) and Golota (41-7-1, 33 KOs), idle since retiring after the first round with a left biceps injury against Ray Austin in November 2008, are friendly and have boxed on the same card together before. But this is business. "Golota is my friend, but you know Andrew is a little bit older. I am younger," Adamek said. "Maybe Andrew has one or two fights more and that's it. Maybe it's my turn next, but after me there will be someone younger. That's the way it goes. " Able-bodied: Sergio Martinez is willing and more than ready to fight Paul Williams. Although the Dec. 5 Kelly Pavlik-Paul Williams middleweight championship fight is down the tubes, called off Wednesday because of Pavlik's ongoing left hand problem, Williams will still fight on that date and headline an HBO "World Championship Boxing" card, according to HBO Sports president Ross Greenburg. However, promoter Dan Goossen must find a new opponent for Williams, as well as a new venue since Boardwalk Hall in Atlantic City, N.J., is not interested; Pavlik was the big draw there. The most likely opponent is junior middleweight titlist Sergio Martinez, who was being lined up to fight in an untelevised HBO undercard fight on either Dec. 5 or 12 as an insurance policy in case Pavlik's hand injury forced him out of the fight, which it did. "We're ready, willing and able to fight Williams and there is nobody in the world who will give him a more difficult fight at 154 pounds than Sergio," Lou DiBella, Martinez's promoter, said. "These are the two best lefties in the division, the two best guys in the division. I don't think it's an easy fight for Williams or for Sergio. I've had preliminary discussions with Goossen. I knew the Williams people and HBO wanted us on one of those undercards in December in case of this eventuality with Pavlik. Sergio was getting ready to fight a southpaw just in case. We had always been kept in mind as the insurance policy. Now they need someone and we're deal makers not deal breakers but if they think Martinez is coming for ham sandwich, they're wrong. Come with a proper offer and we'll make the fight in two seconds." Goossen is also talking to Universum, which promotes titleholder Sergei Dzindziruk. Williams holds the interim version of the title and is the mandatory challenger. "Goossen said, 'I can always make Williams with Dzindziruk,'" DiBella said. "I think it was Goossen's way of badly starting negotiations for a Martinez fight." • Junior welterweight Victor Ortiz (24-2-1, 19 KOs), the 2008 ESPN.com prospect of the year, will return from his sixth-round TKO loss to Marcos Maidana in June and subsequent wrist surgery on the Dec. 12 HBO card headlined by the soon-to-be-finalized Juan Diaz-Paulie Malignaggi rematch in Chicago. Ortiz, 22, who took a lot of heat for quitting after a sixth-round knockdown in the fight of the year candidate, will face former welterweight title challenger Antonio Diaz at a maximum weight of 144 pounds, Golden Boy matchmaker Robert Diaz told ESPN.com. Everyone has agreed to the fight and HBO has approved the match, although contracts still need to be signed. Diaz (46-5-1, 29 KOs), who is 4-0 since returning from a three-year retirement in 2008, fought for welterweight world titles twice, getting stopped by Shane Mosley in 2000 and by Antonio Margarito in 2002. • Let the hype begin! HBO's "24/7" returns for its seventh installment with the debut of "24/7 Pacquiao/Cotto" on Saturday night (10:15 ET/PT). The four-part series will chronicle the buildup and training camps as pound-for-pound king Manny Pacquiao and welterweight titleholder Miguel Cotto prepare for their much-anticipated showdown Nov. 14 (HBO PPV) at the MGM Grand in Las Vegas. HBO, which has won seven Sports Emmys for the series, has had cameras in the Philippines following Pacquiao's preparation as well as in Tampa, where Cotto is getting ready for the fight. Episode 2 debuts Oct. 31 (11 p.m. ET/PT), episode 3 debuts Nov. 7 (9 p.m. ET/PT), with the finale premiering Nov. 13 (9:30 p.m. ET/PT). All episodes have multiple replays and will be available on HBO On Demand. • For most promoters and fighters, their relationships are strictly business. That's not the case for Gary Shaw and junior middleweight contender Alfredo "Perro" Angulo (16-1, 13 KOs) of Mexico. Angulo faces Harry Joe Yorgey (22-0-1, 10 KOs) on Nov. 7 (HBO) on the Chad Dawson-Glen Johnson II undercard in Hartford, Conn. For the final stage of his training camp, Angulo has set up shop at Shaw's home in Wayne, N.J. He is living with Shaw and his family. "I came early to spend some time here with Papa Gary," Angulo said. "I want my body to get acclimated to the weather because it is a lot colder than what I am used to, especially in November. I've enjoyed the last week and will spend one more week in Gary's home in New Jersey before we go to Connecticut next week. ... I don't know of any other promoter who would do this for his fighter. Gary knows this fight means everything to me and I didn't want to leave anything to chance. Gary was kind enough to house my team to allow me to train early on the East Coast." Said Shaw, "Why wouldn't I do everything I could to help my fighter win? It was a no-brainer. Plus, it's been a lot of fun. My family has really enjoyed having them here and it's made Angulo and me a little bit closer." • Fans attending former light heavyweight champ Bernard Hopkins' ring return will also be supporting worthy causes. Hopkins (49-5-1, 32 KOs), fighting for the first time in 14 months when he faces Enrique Ornelas (29-5, 19 KOs) on Dec. 2 (Versus) in his hometown of Philadelphia, wanted to give something back to his community. So he's committed to donating $3 from each ticket sold to charity. Three charities will receive $1 apiece from each sale: Make-A-Wish Foundation of Philadelphia & Susquehanna Valley (in memory of Shaun Negler, a huge Hopkins fan, whose last wish was to attend Hopkins' fight against Joe Calzaghe before succumbing to brain cancer in late 2008 at age 18); The Hero Thrill Show (an annual day of events designed to raise money for the education of relatives of deceased police and fire personnel killed in the line of duty while protecting Philadelphia) and the National Breast Cancer Foundation (in memory of Hopkins' late mother, Shirley, who had the disease). "I'm thrilled about the opportunity to once again bring a fight to the city of Philadelphia," Hopkins said. "A lot has changed in my career since I fought here six years ago and I want to give my fans the chance to see me fight again at home. To top it off, a portion of the proceeds will go to three charities that are extremely important to me." • Light heavyweight titleholder Zsolt Erdei (30-0, 17 KOs), from Hungary and based in Germany, has made 12 defenses against lesser opponents, but takes on a big challenge by taking a shot at a cruiserweight belt. He'll move up in weight to face Italy's Giacobbe Fragomeni (26-1-1, 10 KOs) on Nov. 21 in Kiel, Germany. Fragomeni, who will make his second defense, has lost only to former champion David Haye in a European title bout. Also on the card, interim junior lightweight titlist Humberto Mauro Gutierrez (26-1-1, 19 KOs) of Mexico defends against Germany's Vitali Tajbert, a 2004 Olympic bronze medalist. • Welterweight Delvin Rodriguez is headed to Poland for a title eliminator against Rafal Jackiewicz on Nov. 28, promoter Joe DeGuardia told ESPN.com. Rodriguez (24-3-2, 14 KOs), a staple on "Friday Night Fights" in recent years, is coming off a split decision loss to Isaac Hlatshwayo for a vacant title in August in a rematch of their title eliminator draw. The winner of Rodriguez-Jackiewicz would become Hlatshwayo's mandatory challenger. "Delvin is as dedicated as he's always been and he's going to Poland to win," manager Stan Hoffman said. "He'll go wherever he has to. He can't wait and wants to come back in the title picture again." • Former welterweight champ Zab Judah has a new opponent and former lightweight champ Joel Casamayor has an opponent for their respective bouts on a Nov. 6 pay-per-view card from The Palms in Las Vegas. Judah (37-6, 25 KOs), originally slated to face Ramon Montano, has seen a downgrade in opponent to Adailton DeJesus (22-4, 17 KOs), a career featherweight who was stopped in the first round of a lightweight bout in his last fight in August. Casamayor (36-4-1, 22 KOs), idle since being relieved of his title via 11th-round knockout by Juan Manuel Marquez in September 2008, returns for a junior welterweight bout against Jason Davis (11-4-1, 3 KOs), who has lost three in a row, including his last two by knockout.